Northants have built a successful venture by the element of surprise in one-day competitions, but former England batsman Jonathan Trott believes their secret is well and truly out. The Steelbacks lifted the NatWest T20 Blast trophy title for the second time in three years last season, making the most of their underdog status to pinch the title at Edgbaston. That, coupled with Warwickshire’s Royal London One-Day Cup victory, means the two face off on Thursday each with crowns to defend in their 50-over opener. But having made their name as limited-overs underdog specialists, Northants are known as a danger to everyone across the shires – that’s according to Trott at least. “Northants play some excellent white-ball cricket, they’re excellent in T20 cricket and there are guys in there, all-rounders, who can win the match with either bat or ball, they have a lot of options in there,” Trott said. “That makes them a very dangerous side, but also a fantastic way for us to start off, under lights at their place and just to see what we’re capable of right from the start. “It’s a good test for us, there are no easy games in this competition whatsoever. “We’ve got some really tough away games and some good teams are coming to play us at Edgbaston so nothing will be given to us. “County cricket is very strong at the moment. Warwickshire, Northants and the remaining 16 counties are looking forward to a new schedule for the 2017 season. The problem of missing stars has not been too much of a problem for Northants, though Trott has been impressed by one explosive batsman in particular. 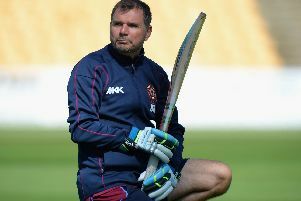 He added: “I’ve not seen Ben Duckett much but he has been impressive, he’s one of those younger, modern players that’s come through and can hit a clean ball, 360 degrees around the park. “It’s fantastic for English cricket to be able to call on these guys who play the one-day game, and for one-day cricket as a whole to be thought about and given the attention it deserve.